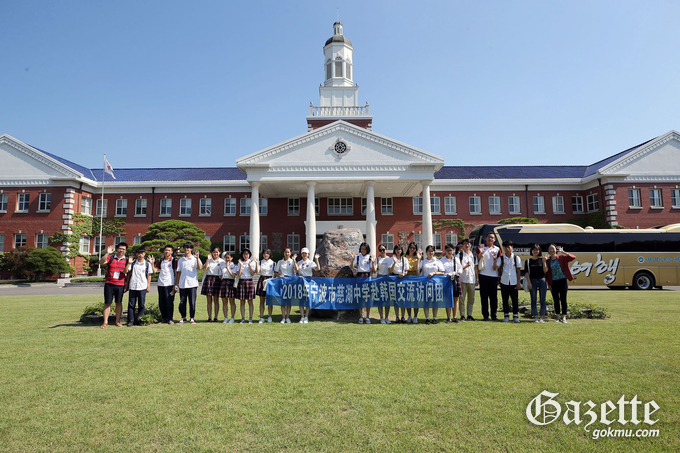 On July 24, representatives from Shinmyung High School and Ci Hu High School in China visited KMU. Shinmyung High School, which has a sisterhood relationship with KMU, travelled with teachers and the principal, while Ci Hu High School brought nearly 30 students and faculty. During the four-hour event, delegates took a tour of the school facilities. The group also visited Hengso Museum where they learned about Korean history and culture. They saw two permanent exhibition rooms and a special exhibition hall which displayed the history and culture of the local community. The students were surprised to find such a large museum in the university. From the vicinity of the chapel, they walked along a path of artificial waterfalls and visited Hanhak-chon. In Hanhak-chon, they took lessons in Korean traditional manners. They learned about the origin of hanbok, features of hanbok, how to wear hanbok and manners for drinking tea. After this lesson, the students all wore beautiful hanbok to complete the experience. They finished their schedule by learning the New Year's bow.